That’s exactly what our TimeStorm IDE accomplishes, enabling you to bring products to market faster while at the same time ensuring your products have an appropriate security posture. Accelerates development of applications and systems for IoT and other embedded devices using Arm, Power or x86 based processors. Supports Windows 10, making it easy to create embedded Linux products within a Windows environment. This feature makes it an ideal solution for developers who want to migrate from microcontroller development to the development of microprocessor-based Linux devices. Autodiscovers available Yocto SDKs, accelerating product creation while hiding the complexity of Linux development. It uses the same Yocto SDK under Linux and Windows host OSs, eliminating any potential issues related to using different toolchains on different host OSs. Enables development in Python (in addition to C/C++) with the addition of on target debug for Python enables easier development of IoT applications and machine learning. Streamlines workflow using Git source code management and makefiles. Features U-Boot development of custom bootloaders, needed when adapting Linux to a new hardware platform. See TimeStorm in action on our YouTube channel: https://www.youtube.com/playlist?list=PLg618RQiQGR16JvKSMaf0AEkv0pB8rbtH. Sign-up today for a free 30-day evaluation of TimeStorm. The registration link is https://linuxlink.timesys.com/register/, and the free 30-day evaluation license can be generated at https://linuxlink.timesys.com/ide/. 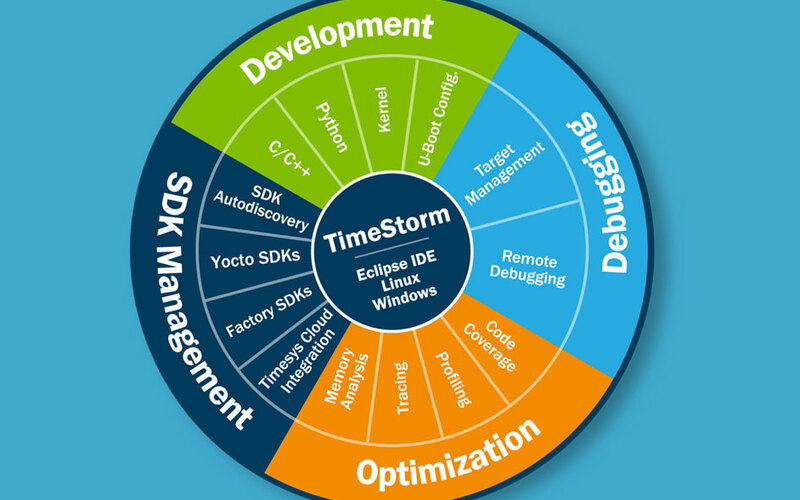 For more information about TimeStorm, and to purchase the new IDE version, visit www.timesys.com/timestorm.